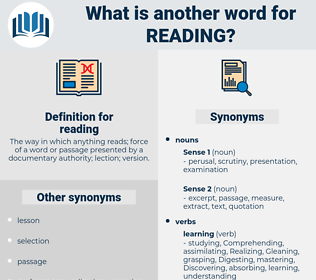 What is another word for reading? The way in which anything reads; force of a word or passage presented by a documentary authority; lection; version. references, Records, articles, Publications, documents, structures, says, titles, systems, Lis. deliberations, holdings, presentations, discussions, Measurements, participants, texts, courses, consumers, materials, Students, skills, Schools, Studies, bills, pounds, states, articles, Publications, structures, titles. Fleurs-de-lis, data, Lis, handling, hearing, processing, consideration, following, wording, recommendation, measurement. Addressing, teachers, Hearings, attending, reviewing, Delivering, reporting, identifying, Indicating, evaluating, immigrants, speaking, Considering, Receiving, Examining, accessing, intervention, Enrolling, Analyses, Treating, Witnessing, pursuing, ranging, Presenting, printed, Debating, judging, waiting, Noting, diving, according, Discussing, tackling, Depending, smiling, being, using, sections, taking, items, Providing, knowing, coming, singing, seeing, voting, tending, lit, looking, believing, Having, Stating, drinking, Plugging, going, showing, getting, articles, handling, hearing, viewing, following, wording. 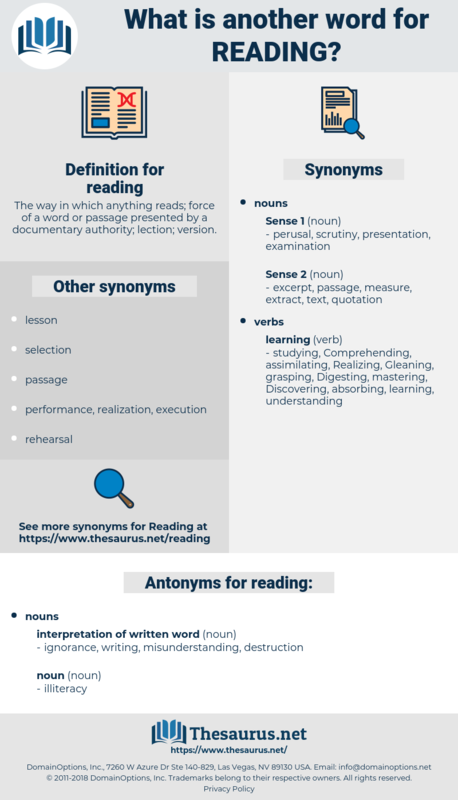 reads, readability, readership, read, perusal, viewing, discussion, examination, time. Reciting, Deciphering, Achieving, scanning, processing. One, seated in an arm - chair by the fire, was reading the Morning Post. What if you take another plan for your reading? ruddiness, rittenhouse, redeeming, readiness, rotting, ratting, radiancy, readying, reedmace, rhodymeniaceae, ready-mix, rottenness, rewarding, radio news, rethink, reed mace, radiating, Road To Damascus, rowdiness, rating, redness, radioimmunoassay, rewording, redding, red ink, rewriting, raiding, riding, radio noise, redwing, red-ink, rooting, rioting, rudeness, radiance, riddance, rhythmic, rationing, redneck, reding. perusing, browsing, speed-reading, poring over, skim, skimming, studying, browse, perusal.